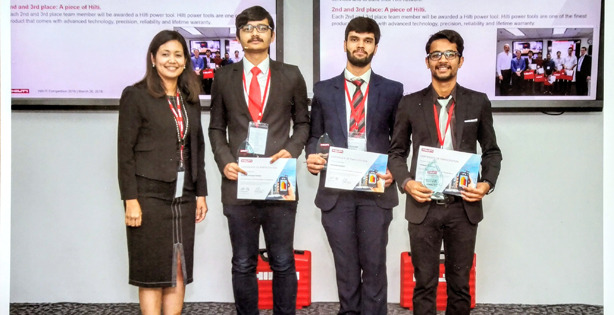 BITS Pilani students’ team comprising of Rishank Pandey, HimanshuGoyal and Ruddhi Prasad was selected as one of the Top 5 International Teams in the World Finals of Hilti IT Competition 2018.The team was offered an all-paid trip to Hilti Asia Headquarters, Kuala Lumpur, Malaysia to participate in the competition from 28th-30th March, 2018 to present their prototype on-site, where they won the People’s Choice Award. Every year Hilti organizes an IT competition to help solve some of the industry’s most pressing problems. Students and graduates from all over the world join the competition to both prove themselves and to kick-start their careers. Attracting over 400,000 students from 60 countries, the 2018 competition revolved around two major themes: Implementation of Internet of Things and Augmented Reality in the Construction Industry and Digitization of Customer Interaction. The competition had three rounds. Initially, the teams had to submit a minimum viable product, presentation and business model, out of which a few were selected for the semi-finals. The semi-finals involved a presentation and interview via video-conference and finally, top 5 teams were invited for the on-site finals.The on-site event was graced by Dr.Martin Petry, CIO, Hilti, ThavaneswaranKaruppaiah, Head of Global IT Operations and Prof. Tan Kian Lee, Head of Department, Computer Science,National University of Singapore. Other finalists included the teams from Carnegie Mellon, National University of Singapore, Hong Kong University of Science and Technology et al.